A day in the life of Swansea's famous Kardomah Café opens the Great Welsh Cafes series - more programmes follow each weekday till Friday. This half-hour programme traces the history of the bustling café, which was frequented by Dylan Thomas and his friends ­ "The Kardomah Boys" - in the 1930s. Dylan described it as "My Home Sweet Homah" and the cafe is just as popular today with a new generation of loyal customers, many of whom go several times a day, queuing outside in all weathers to sample the coffee, roast dinners and home-made cakes. Although it is 50 years since the poet died, some of Dylan's contemporaries still frequent his favourite cafe, including 89-year-old Timothy Perkins. He recalls seeing Dylan in the Kardomah every Saturday morning with his gang: the composer Daniel Jones, artist Fred Janes, broadcaster Wynford Vaughan Thomas and poet Vernon Watkins. He said: "He wasn't really my cup of tea. I thought he was a bit of a show-off. We would say hello and then he would go and sit at one table, and I would go and sit at another." Despite his reservations, Mr Perkins later went on to form the Dylan Thomas Society of Great Britain. "No-one would be more astonished than Dylan himself to learn that I had started all this adulation!" he said. The original Castle Street premises of the Kardomah were destroyed in the Three Nights Blitz in 1941 and rebuilt after the war at its present home in Portland Street. That too was threatened with demolition in the late 1990s when it got in the way of council plans to rebuild the city's shopping centre. But a huge campaign mounted by fans of the historic café, along with a 20,000-name petition, saved the day. Owner Marcus Luporini, whose parents Pietro and Cathy ran the café before him, said: "People love the fact that the cafe hasn't changed since they first started coming 30 or 40 years ago. We know our customers and there is a lot of banter. It is like one big family." On a tour around Wales, presenter Arfon Haines Davies visits Strinati's in Treherbert and Prince's in Pontypridd, two very different examples of the Welsh Italian cafes that sprang up all over the Rhondda in the first half of the 20th century. 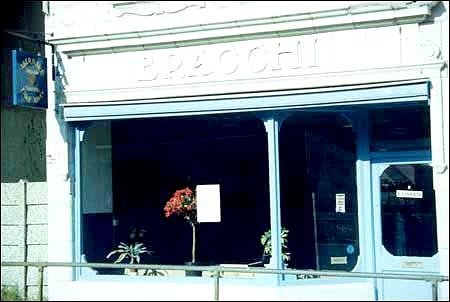 The Bracchi's, as they were collectively known after the first Italian family to set up cafes in the valley, were frequented by miners and factory workers gagging for refreshment after their long shifts. Over the years the mines and factories have shut and many of the cafes have gone with them, but Mary Strinati's café in Treherbert still sells frothy coffee, sweets and cakes to faithful locals who rely on it as a meeting place. Despite mine and factory closures business is still booming at Prince's in Pontypridd, the subject of today's programme. The beautifully preserved art deco style café has customers queuing for tables on market days, despite the fact that it has more than 200 seats. 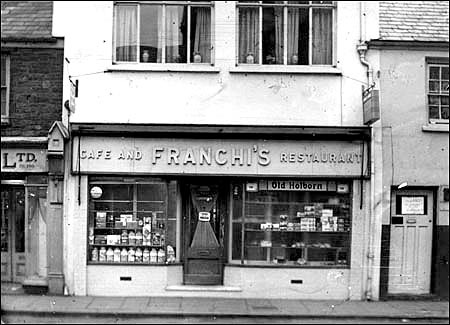 Owners twin brothers Joseph and David Gambarini put the café's success down to not meddling with a successful formula established by their parents Dominic and Glenys in 1948. As one satisfied customer put it: "This is the best place around. It's like you go back in time when you come in here." The eye-catching display of cream cakes and patisserie in the window ­ all homemade on the premises ­ also helps to pull in the customers. "We start off with coffee and toast and then after an hour we have another coffee and a cake," said one regular who says she comes to the café every Wednesday "for a two hour gossip". The café is equally popular with its staff, many of whom work there from the day they leave school until they retire. They even keep coming back for more: "When I retired I used to keep popping back to help out behind the counter because I missed it so much," said Diane Morgan, who worked as a waitress there for 31 years. They miss the cakes too: "It spoils you, really, because you don't fancy anyone else's," said Daphne Angwin, who spent 27 years working at Prince's. 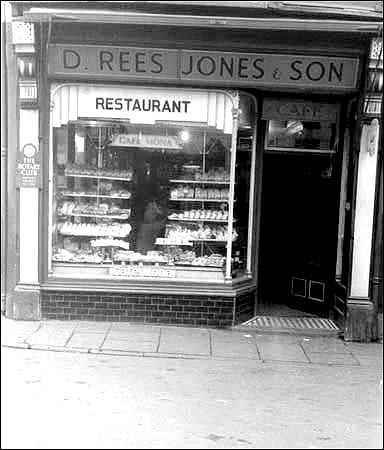 Fashions may have changed but eight of these distinctive eateries still remain in Wales and two in England. Four of the Welsh establishments still occupy their original sites in Machynlleth, Aberystwyth, Llanidloes and Welshpool. The National Milk Bar idea was the brainchild of Mid Wales dairy farmer, R.W. Griffiths as a way to market his produce. 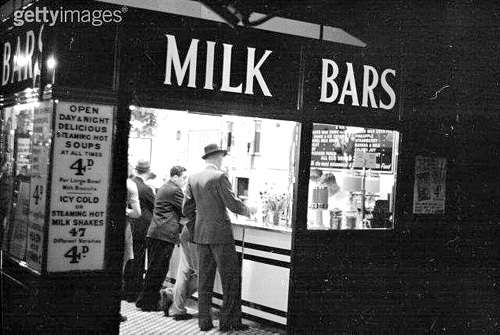 'Willie' Griffiths opened the first National Milk Bar in Colwyn Bay in 1933 with the idea of selling the milk and cream from his farm at Forden directly to the public. It was a big hit and 'Willie' Griffiths went on to open a total of 17 bars in Wales and North West England ­ all with their signature black and white chequered floors, bar stools, jukeboxes and gleaming chrome fixtures. In those days, before health scares and dietary fads, milk and milk shakes were the trendy drinks. The Beatles frequented the milk bar in Lime Street, Liverpool and teenagers everywhere followed their example. The Griffiths family's 500-acre farm also supplied the eggs, cheese, butter, bacon, sausages, potatoes and other vegetables sold in the cafes. The farm eventually had to stop supplying the chain when the Milk Marketing Board was introduced and all farmers' dairy produce had to go through them and be pasteurised. However, the business kept going with other family members running it after the death of the founder in 1962. The present Managing Director, John Frost says the family has kept the farm and some of the National Milk Bars going while others have been changed to fast food outlets for business reasons. 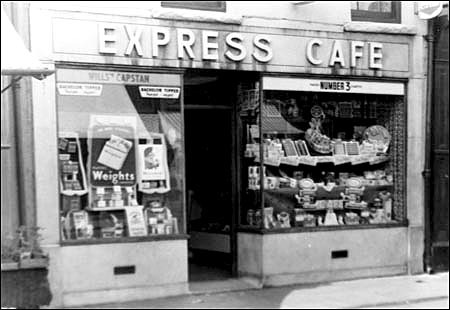 He said that in the 1960s the National Milk Bar was the only eatery in Welshpool, but it now faces competition from 25 other food outlets in a town with a resident population of only 8,000. Manageress, Helen Kite is confident and bubbly and a good talker. She runs a staff of 15 and has worked at the café for 17 years, having started at the age of 12, washing up for 50p an hour. Whatever the future holds for National Milk Bars, they have attracted a cult following. There's even a website paying tribute to them set up by a group of fans who've visited every NMB. The mines and the factories may have disappeared from the South Wales valleys but some things stay the same - Mary Strinati's café in Treherbert still sells frothy coffee, sweets and cakes to faithful locals who rely on it as a meeting place. 55-year-old Mary, whose father Camillo ran the shop before her, is looking to retire, but says her customers won't let her. "Where else would they go?" she said. Mary started work in the shop 34 years ago. In those days they opened at 6am to catch the early morning workers and closed at 11 or 12 at night. "It was very good money in those days. The men used to queue up to buy cigarettes and sweets in the morning. We had eight double deckers of workers parked on the hill. Since all the mines and factories have closed down our trade has gone down too. We take only half the money we used to take 20 years ago." It may be the age of the fast food outlet but there's still a demand for elegant tearooms in the Victorian style. Take, for example, Badgers Café in Llandudno. It was only established in 1997 but it has already won 25 awards for excellence and has been voted one of the top ten tearooms in Britain several years running. Owner, Barry Mortlock had the idea to open up the tearooms while working in a bank in the town. "I thought it was a shame that such a fine Victorian resort did not have tearooms to match," said Barry. "I wanted our customers to be able to step back in time and have a traditional experience with everything homemade and waitresses dressed in period costume. "It took me three or four years to get it off the ground. I did a lot of research and I visited other tearooms like Betty's in Harrogate." The café was named on a visit to the barbers. "My hairdresser had nicknamed me Badger," said Barry. "So when I told him I was thinking of opening a café, he said: 'You'll have to call it Badgers Café then.' So I did and now everyone calls me Mr Badger." The café has its own bakery above the premises and all the food they serve is homemade. As a result they employ 38 people, which is a large number compared to most cafes. Staff include head baker, Paul Owen, nicknamed Scorcher, head chef, Maria Metaxa, who is from Cyprus and general manager, Donna Horton who was named Welsh Tourism Manager of the Year. Regular customers include TV's 'Loose Women' presenter and 'Emmerdale' and 'Coronation Street' actress, Sherrie Hewson and two local women who've been to Badgers every day since it opened. Altogether, the café serves around 3,000 customers a week. In his newly-rented first-floor Fleet Street office 17 months ago, an ex-miner, the Hon. Hugh D. McIntosh sat ruminating on the possibilities of selling milk to the nation in a new way. Across the road was the "Cheshire Cheese" hostelry, famous haunt of journalists. Thought McIntosh: "Why not sell milk across a bar, like beer?" Britain's first stool-and-counter milk bar was born a few weeks later. People laughed at the idea of selling milk in Fleet Street. By the end of the first week they were gasping. The bar was packed out. Reporters who had never before been heard to call for anything weaker than Burton, were passing their tankards up for straw berry shakes. A descendant of one of the few survivors of the Black Hole of Calcutta, McIntosh was born in New South Wales, Australia, began his working life in the famous Broken Hill silver mines when a stripling. Trekking to Sydney, he joined up with a cattle station and made his first acquaintance with milk by tending cows. In quick succession, he became pastry cook, cafe manager, restaurant magnate. At 40, McIntosh was said to be Australia's most influential man. His spare time was spent directing newspapers and theatres. But his passion was sport. He astounded Europe and the United States by booking the Burns-Jack Johnson fight for Sydney. In England, he promoted boxing-matches at Olympia. Since opening Britain's first permanent milk bar, McIntosh has started 11 others. Nine are in London, three in the provinces A chain of 500 is his aim. 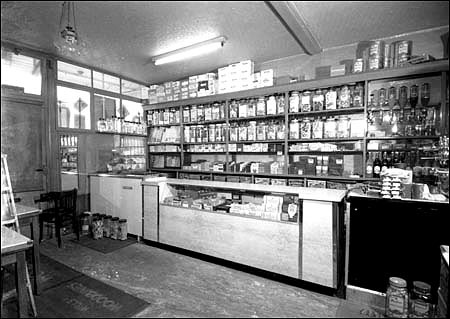 Black and White Milk Bars, Ltd., the company controlled by him is expanding rapidly. Chief rival is National Milk Bars Ltd., directed by a Welsh farmer, R. W. Griffiths, and his brother, Professor Moses Griffiths. The two brothers own ten bars in the provinces arid are planning others. R. W. Griffiths had only 100 acres when he started farming on his own account as a young man 14 years ago; now he farms 835 acres in Montgomeryshire, South Wales, milks 250 cows, breeds ewes and sows, has 1,500 head of laying poultry and is a member of the Regional Milk Committee. Moses Griffiths, besides being Professor of Agriculture at Aberystwyth University, is Lands Director of the Cahn Hill Improvement Scheme; frequently he gives radio talks. Every milk bar operated- by the Griffiths brothers is supplied with Tubercular Tested milk and produce from the electric-powered Welsh farm, one of the most modern in Britain. Charles Forte, Managing Director of Strand Milk Bars, Ltd., which operates Meadow Milk Bars, at present controls two. In catering circles the name of Forte has been respected for years. On the South Coast, where the family controls a number of restaurants, it is a household word. Apart from .the chain firms, small companies and individuals are running single bars. Present total is 138. All are under the paternal eye of the Milk Marketing Board, which now has a separate Advisory Board, directed by go ahead B. M. Hale. Capital invested exceeds £165,000. More would be forthcoming but for difficulty of finding satisfactory locations. Though a bar can be started on £1,200 and organisers are willing to pay up to £2,000 a year for premises, suitable sites are few. Last year the industry developed more rapidly in Yorkshire and Lancashire than in any other area, including London. During the Blackpool season, 16 establishments did a flourishing business. But; like those operated for, years at agricultural shows by the National Milk Publicity Council and the Milk Marketing Board, they were only temporary. On a larger scale are the bars in cafes and department stores. Throughout the country are 299 cafes, 117 departmental stores, and 13 cinemas, with their own milk counters Mobile units already number 17. The Drapery Trust - through Debenhams - controls 150 store cafes with milk bars. On these and similar activities milk producers, milk food, and fruit juice manufacturers look with jubilation.